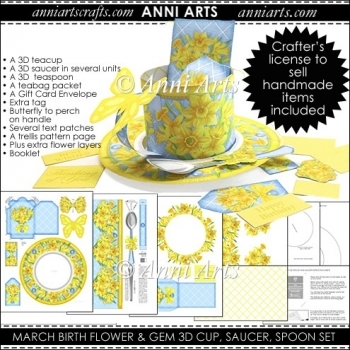 A luxury fully round 3D Teacup and Saucer set that features the March flower bouquet and birth stone gem (Daffodil and Aquamarine) to print on card stock as a keepsake craft and gift container in one. 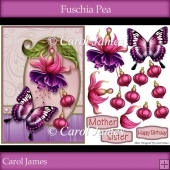 A pretty butterfly and extra decoupage flower layers are included. 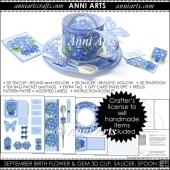 The 3D Teacup, saucer and spoon make fab containers for favors, gifts, chocs and sweets. They are properly sized, have deep saucers and realistically shaped hollow spoons. 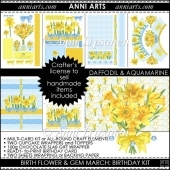 The Birth Flower and Gem cups make super gifts for birthdays or at any time of year as all-purpose gift. 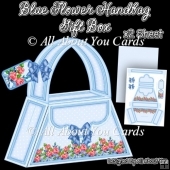 Also ideal for get-well or thinking-of-you wishes, thank you tokens, sympathy gifts, gardeners, flower lovers and more. 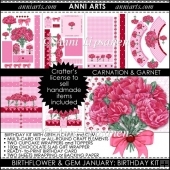 THE LICENSE FOR GENUINE HANDMADE ITEMS IS INCLUDED! 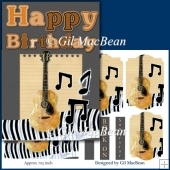 No selling of graphics as downloads or sheets, no making of new graphic collections, clip art or CDs. No selling as digital embroidery. 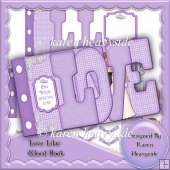 No sharing of purchased files or use in craft classes by duplicating the graphics for students (use as a single demo set is ok). Please keep the Anni imprint intact. 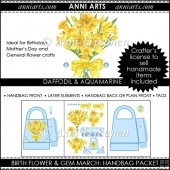 Women love to collect items with their particular flower and gem at any time of year. 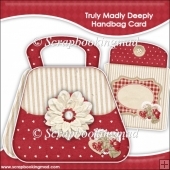 This unique design for an unusual gift pack will get oohs and aahs and become a treasured keepsake. 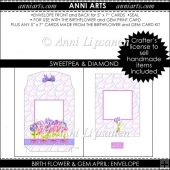 Or why not make one just for yourself with your special flower! 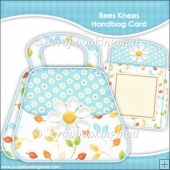 Each cup also has a packet and tag for a real teabag as a little gift to finish the ensemble perfectly. 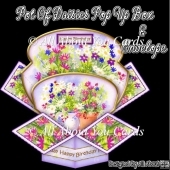 There is an optional gift card envelope too.The teabag is a gift in itself, but all sorts of small gifts, choccies, socks, tealight candles, sweets, craft equipment and more can be placed in the cup - and watch the sheer delight when you present it! 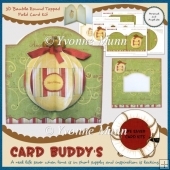 Included, is patterned trellis paper to print as inner lining for the cup by printing the page first, then print the mug on the reverse. It can also be used as gift wrap. Add the tag that is included too. The cup uses the same easy Anni Arts mechanism as the 3D mug, but the cup has more parts and thus takes a bit longer to make - but it is so worth it! Download and print. Frugal fun for January girls! The 300 dpi PDF graphics are on A4. 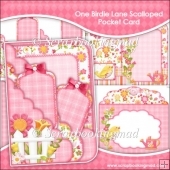 1) You will receive the digital craft set as downloads in zipped files containing the printable graphics in PDF format. 2) You will need an unzipping program like Winzip or similar. Your computer is bound to have some unzipping program installed. 3) The pages are on A4. 4) You will need a colour printer to print the pages. Set your printer quality to "best". 5) Suggested paper: Matte photo paper like Canon 170gm which is especially for Arts and Crafts and plain paper for the paper projects. I also like Stora Enso cardstock which is the same bright white on both sides for double-sided printing.